A couple of weeks I delved into Adventures of Pip, a game that used a pixel mechanic to great effect. Now, I dive into a game that's about pixels and uses them in a different way. How? 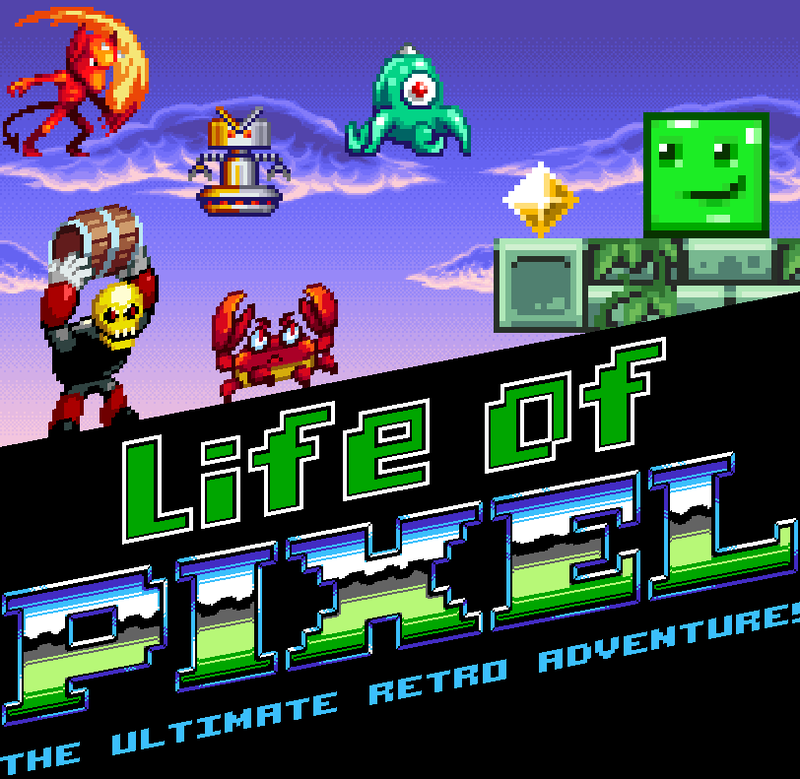 Find out with my review of the newly released Wii U eShop game, Life of Pixel! More Like "The Many Deaths of Pixel"
Retro and indie go together like peanut butter and jelly, bacon and eggs, ketchup and mustard, salad and dress-- well, you get the idea. 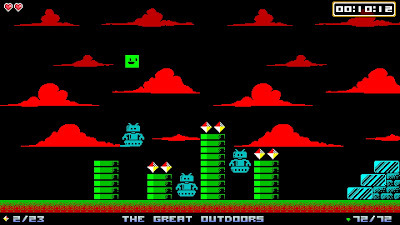 Many independent developers opt to go with a retro style. However, many just do so for aesthetic purposes. Not so with Super Icon's Life of Pixel. The retro art style (or should I say, art styles?) lends itself to the gameplay for a very clever reason. Why the premise itself is creative, there are some niggling issues that prevent Life of Pixel from being truly great. 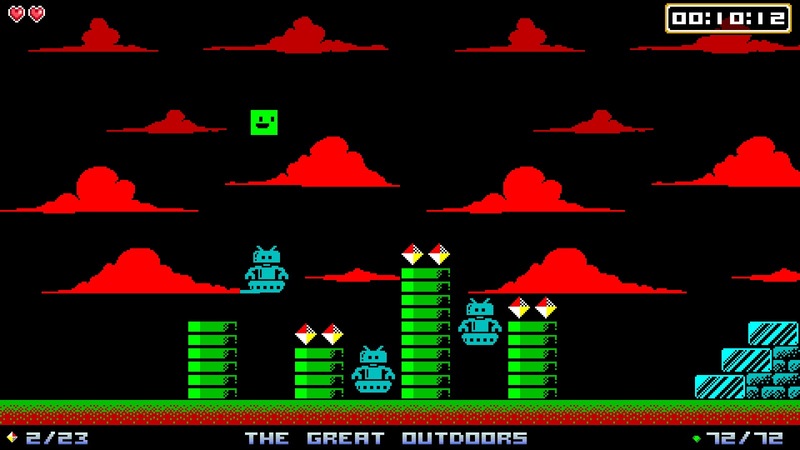 Life of Pixel takes you on a journey through a small history of various retro game systems, such as primitive systems like the Atari 2600, 8-bit systems like the Game Boy, and the 16-bit systems like the Super Nintendo. Each console is its own world, devised up of eight levels, sporting the graphical look of each system. 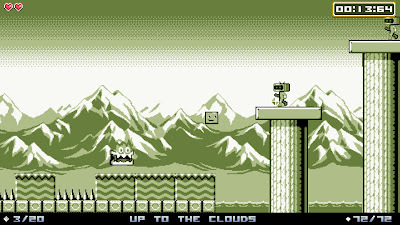 For instance, the Game Boy levels have a subdued black and white color pallet while something like the Super Nintendo features much more color and parallax scrolling. Each system's visuals are nailed to near perfection. 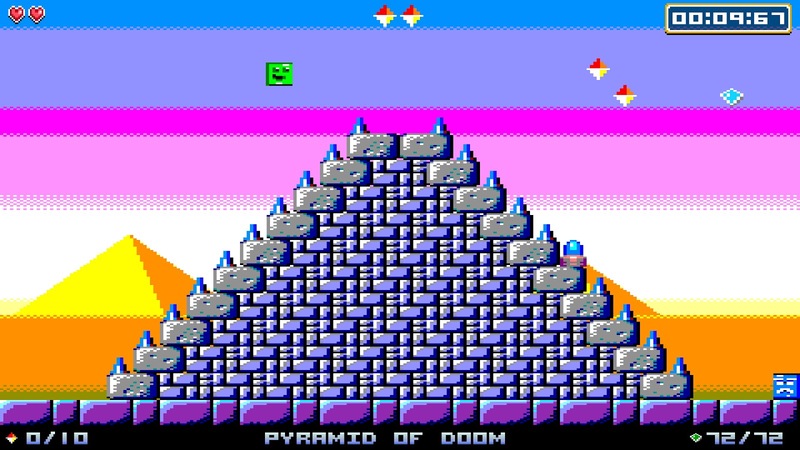 The goal of each level through Pixel's adventure through game systems past is to collect all of the gems within. Then, an exit door opens up, requiring you to reach it to clear the level. Starting off, levels are very basic, keeping to one screen. 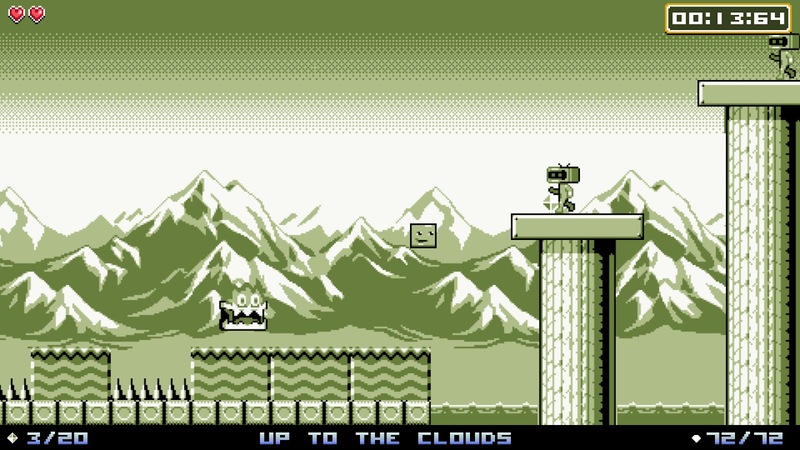 As you progress, you encounter new obstacles, larger levels, fiercer enemies, and harder platforming challenges. are some of the weakest in Life of Pixel. Pixel can't do much. He can jump, then double jump, and that's pretty much it. 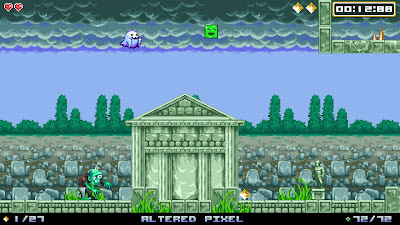 Enemies are to be avoided, but Pixel can take two hits before he dies. If he falls into water, gets pricked by spikes, or hits a bottomless pit, he automatically dies. And death is something you will come to terms with, as it happens quite often. That's because Life of Pixel is a challenging game. You'll die, and then you'll die. The total of Pixel's deaths presents itself between each level. Let this be absolutely clear-- the number will quickly go up. Now, that's not to say that Life of Pixel's difficulty comes from total fairness. This isn't the case at all. Of the over 100 deaths in Life of Pixel's initial batch of stages (i.e. before you unlock new systems, which include much lengthier levels with greater peril to worry about), many of them were unexpected and/or cheap. Many times you'll have to make leaps of faith. This is no more apparent than in some of the early console levels where there is no scrolling. Instead, each level is devised up multiple screens that you have to move between. Sometimes you'll have to jump between screens, not knowing where the platform you need to land on on the other screen is. Thus, a lot of memorization to the levels is needed, and unfair deaths do happen. At least you don't have to share this with your younger brother! That's not the full extent of the level design's cheapness either. Many levels house spikes, but these don't have any indication (i.e. no indentations in the ground, for instance) where they will rise up from, meaning you can often find yourself thinking you're on safe ground only to find yourself quickly skewered by spikes. Spikes also retract into the walls, ceilings, and floors slowly, so if you so happen to catch them in the middle of them retracting, you'll most likely also find yourself dead. Instead, if the spikes retracted as fast as the reveal themselves, it would make for much less aggravation. Spikes-- the bane of my (and Pixel's) existence. Still, even with all of the deaths both fair and not, with Life of Pixel I always found myself wanting to continue playing. There's something here with the gameplay and relatively short levels that encourages perseverance and persistence. Even though you'll suffer plenty of setbacks, whether because of level design issues or your lack of foresight, you'll want to keep going, as the fundamentals of Life of Pixel are just plain fun. For every frustrating moment are two enjoyable ones. 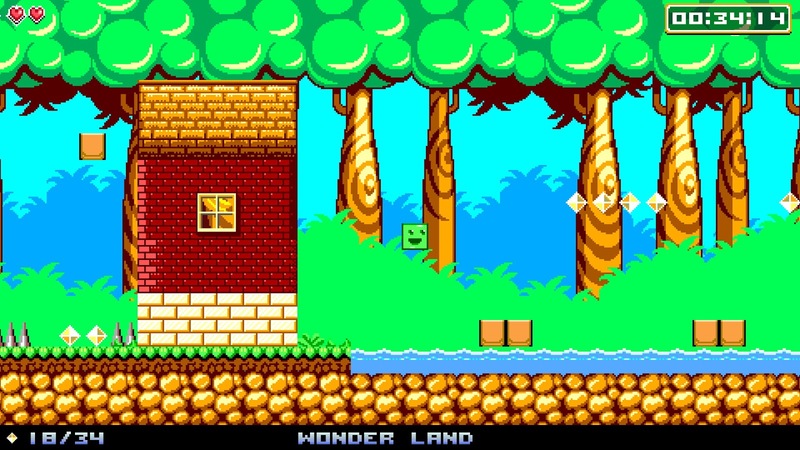 You'll get nostalgia overload with these game-themed levels. Life of Pixel also keeps players playing and engaged with over 20 individual achievements to complete, such as collecting all of the gems in a set of eight levels, and there are plenty of hidden areas in levels that lead to special places where fruit, the hardest collectible to find are housed. Finding them all is one impressive feat. Furthermore, there are online leaderboards for each level, though this function isn't always reliable. I've had error codes pop up during play that booted me from putting up my time. Though maybe that's a good thing, considering how much a speed-runner I am not. will come to Pixel if he bathes in it. 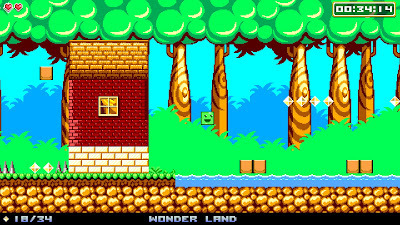 Rather than go with a unified art style for the game, thanks to the creative premise, each world is based off each system's parameters-- how many colors the hardware could display at once, whether levels could scroll, etc. For the most part, no liberties were taken with each console. 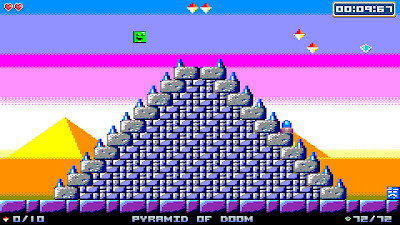 What I mean is that something like the Atari 2600 doesn't have 256 colors, to use an extreme example. Music is also a consideration for each system, and each world offers a song that adequately sounds like its from the system you're playing on. Skate or die. Usually it's the latter on later levels. Continuing with sound, for some odd reason off-TV play is offered, but you might as well keep the TV tuned to the game, as no sound comes from the GamePad. It's a baffling omission, and I can only hope it is rectified with a patch sooner rather than later. If you're not using the GamePad's screen to play on, you can opt to have it show the high scores of the current level Pixel is platforming in. Life of Pixel is indeed half fun and half frustrating. While levels are designed with the various system powers in mind, sometimes this is a detriment to the actual gameplay. Other times, some questionable obstacle placement requires leaps of faith and many replays just to get down locations of hazards. 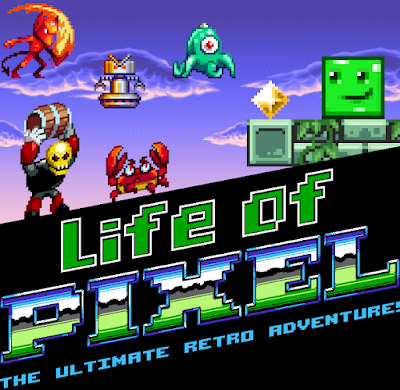 Still, Life of Pixel is quite an enjoyable romp with a killer premise, it's a nostalgic platformer through gaming system graphics of yesteryear, and it will definitely test your gaming skill. Even if a lot of the time the difficulty in the game is for the wrong reasons. Review copy provided by Super Icon LTD.